The road is deserted. You’ve been on the move for more than 5 hours. You’re hungry, and your legs are starting to complain. Suddenly, you see the outline of a tower over the river, just like an oasis. You feel the pull as it draws you near. 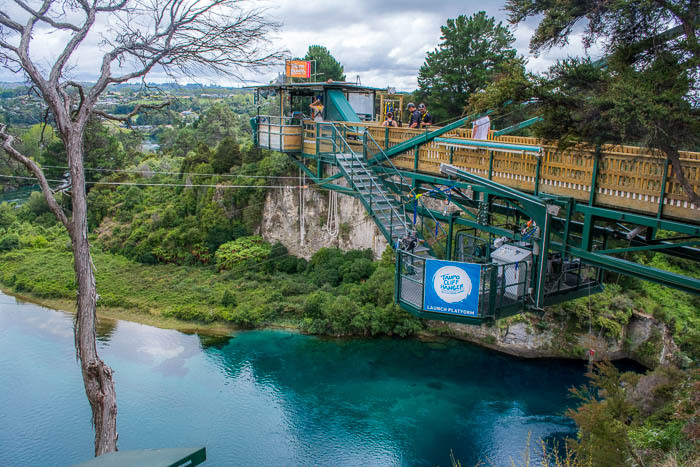 Then, you see the sign: Taupo Bungy– 47m high, and no turning back. If you’re me, you start to shake, even if you have absolutely no intentions of hurling yourself down to the river with an elastic cord as your only lifeline. And just like that, Isaac was taken to the tower, strapped, and, before I could get a good grip on the phone, he was standing over the edge. I am positive I was more nervous than he was. My hands couldn’t stop shaking, and I have the video to prove it. My heart was beating in my stomach as if I were the one about to jump. That’s the kind of chicken I am. He raised his arms and jumped. 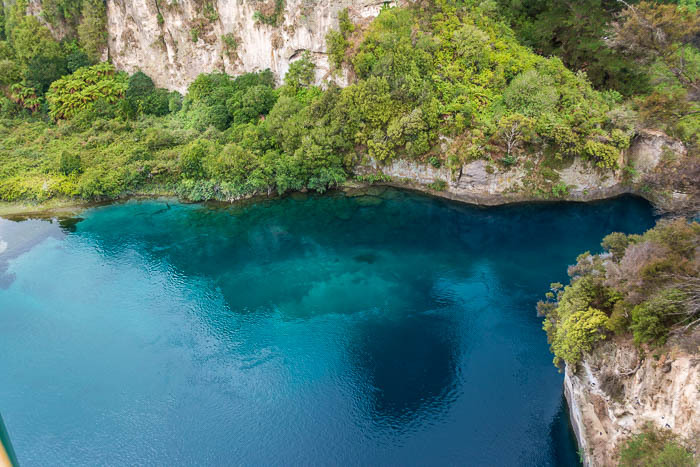 He fell and fell to the perfectly blue waters of the Waikato River. At least he had that gorgeous view. As Isaac’s body traveled through the air, my screams rivaled his. My brother in law (after Isaac had the audacity to send the video to his family) even said that it sounded just like a Fifty Shades of Grey scene. That’s family for you, always eager to make you feel like you want to drown. I’d show you guys the audio but I don’t want to embarrass myself beyond repair. 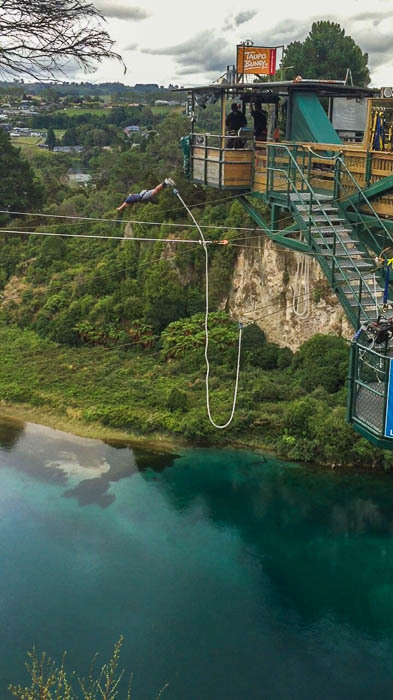 Once safely back up, still on an adrenaline-high, he told me he wished it was higher, that the fall would last longer (talking like a madman), and that the price was a bit much for what the attraction lasts, ($169 NZ dollars, which is roughly $127US dollars). The one complaint we have is that when Isaac jumped, the cameras had “technical problems”, so his video was ruined. It would’ve been a nice souvenir to take home. You know, no 50 Shades-like screaming and all. 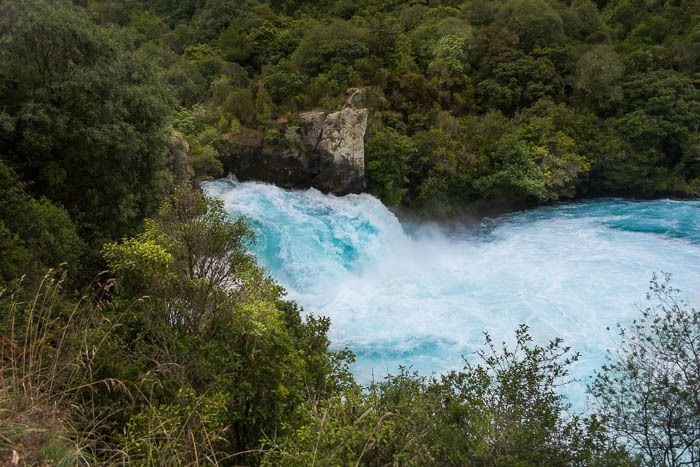 After all the commotion, we started seeing just how pretty Lake Taupo really is. 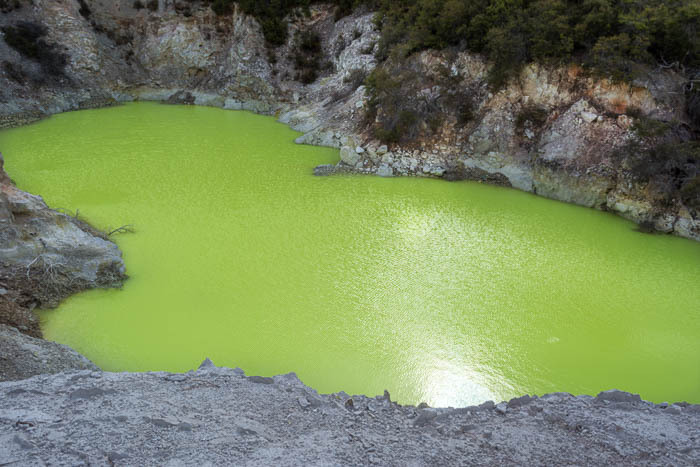 Cool fact, Lake Taupo is New Zealand’s largest lake, and it sits in a volcano’s crater. Literally. 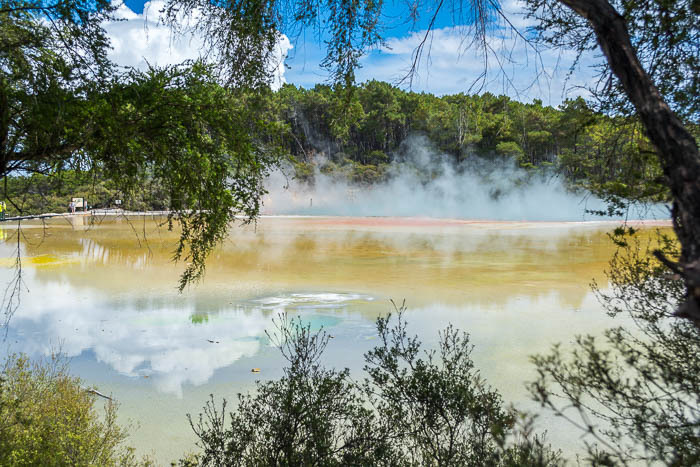 Taupo and Rotorua are still volcanically active and that’s why you’ll find your pick of geothermal spots. 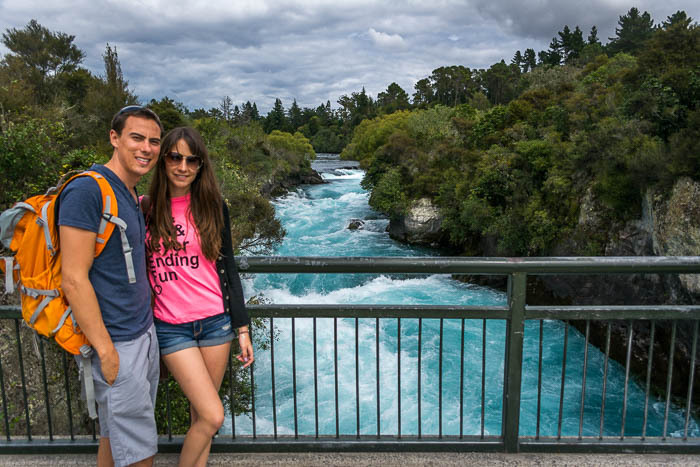 One of the most spectacular sights of the area is Huka Falls. 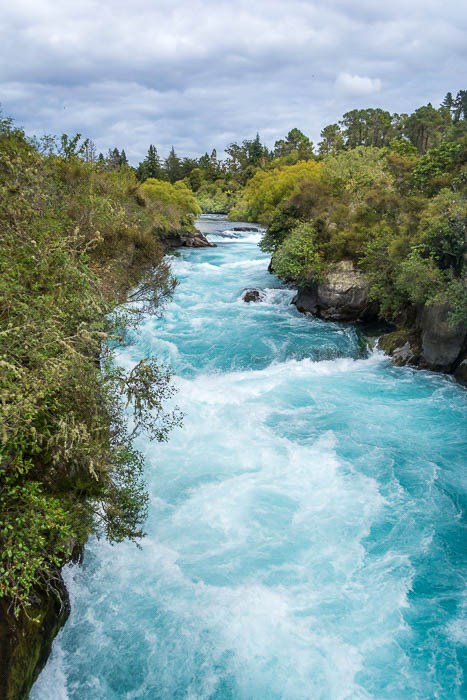 The Waikato River drops 220,000L per second (!!! ), 11m into a foamy pool. It’s really impressive. And beautiful. And powerful. Basically the definition of New Zealand. 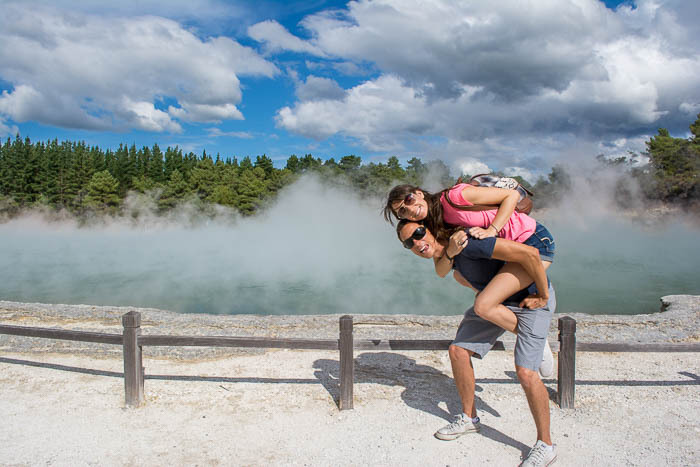 After Taupo, we drove to Rotorua. 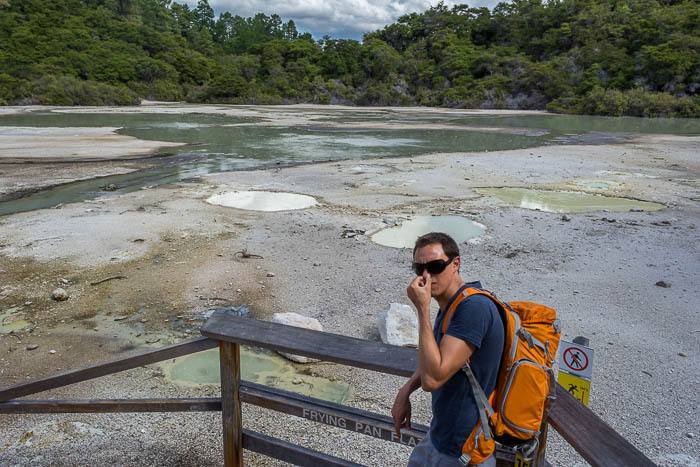 We actually thought about writing an entire post about Wai-O-Tapu. It’s the single most strange and fascinating place we’ve been to. This place looks like the scary woods of a fairy tale, where bad things happen. The place where you know you shouldn’t get close to, but you find its dark and twisty beauty irresistible. The color palette of the place is crazy: green, orange, purple, white, yellow, red and black- each color an indication of specific minerals, which account for the lack of fish life in the stream. We should warn you, the place is covered with the most foul-smelling steam. There’s no escaping it, and no, you won’t get used to it after a while. But don’t let this keep you away. 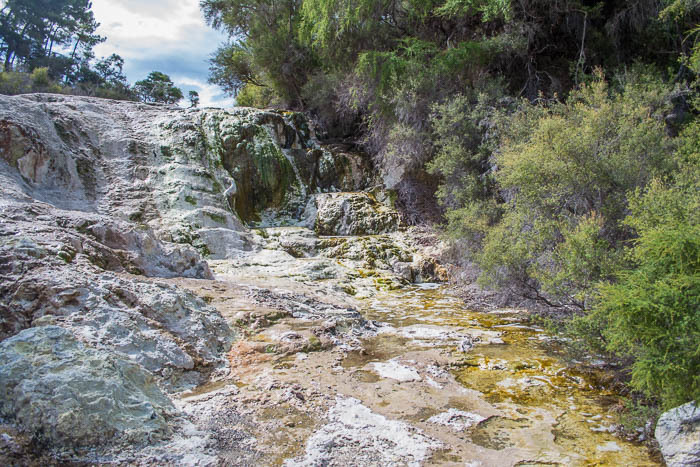 Let’s just think of it as part of Wai-O-Tapu’s charm. 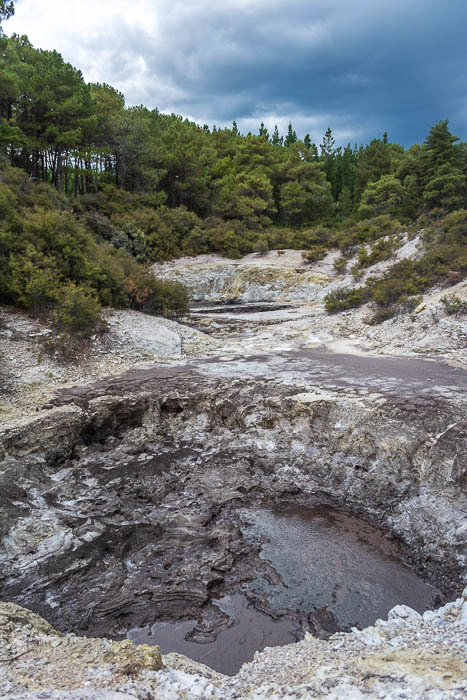 This thermal area is covered with craters, boiling mud, water that reaches the 300ºC and covers approx. 18sq km. 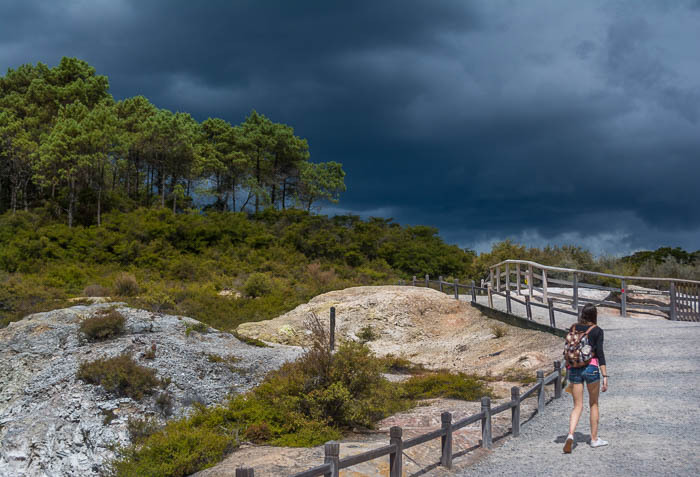 There are three walks you can do, but we suggest you do all three. That’s what we did. On the first walk, we strolled past collapsed craters where water boils at the top, and then we reached the Artist’s Palette. Minerals of all kinds gather below the surface and when they get colder, they reach the atmosphere and paint the water in all sorts of different colors. That particular day, they also made the shape of a monkey. Do you see it? Isaac thinks it’s a pig, and a friend says it’s a pug. What do you think? You know that feeling when someone tells you you can’t do something, and then you just really really want to do it? Well, that was me wanting to touch the boiling water. I couldn’t stop looking a it. I was mesmerized, and I itched to reach out and touch it. Sometimes, instincts are stronger than reason. Lucky for me, there was a guard looking at me like he might tackle me if I took another step towards the water. I walked away. The Champagne Pool is where it smells the worst. 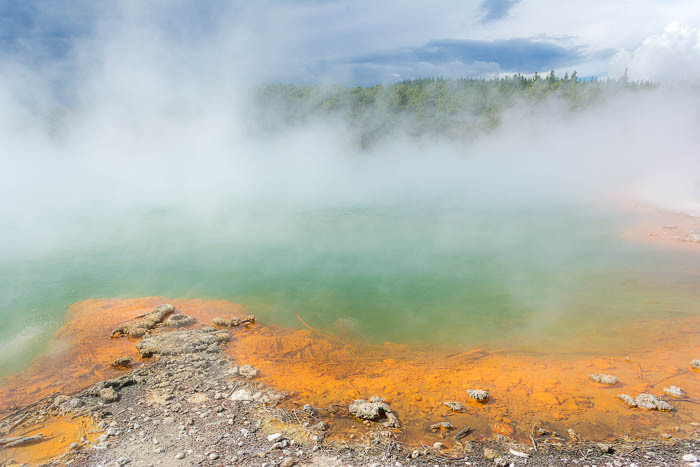 Rotten egg-smelling steam rises and covers the area where the pool lies. It’s hard to see through it and, on a hot day it gets pretty uncomfortable. The weirdness of the pool, though, is worth all of it. The water holds gold, silver, mercury, sulphur, arsenic, and other metals and minerals. It’s practically a pirate’s treasure. The boiling mud pools are weird but awesome. The sound they make is pretty disgusting in a this-is-really-cool kind of way. 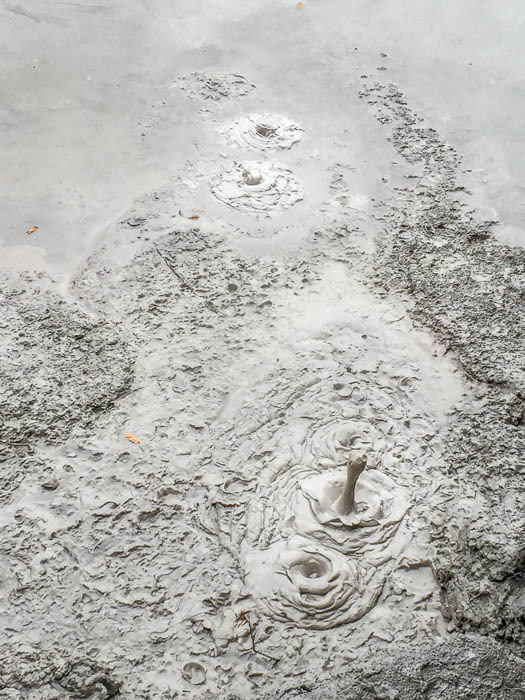 They spurt mud up in the air, and then settle into their guttural dance again. New Zealand really has a way of showing you that nature is fascinating in all her eccentric and diverse creations. 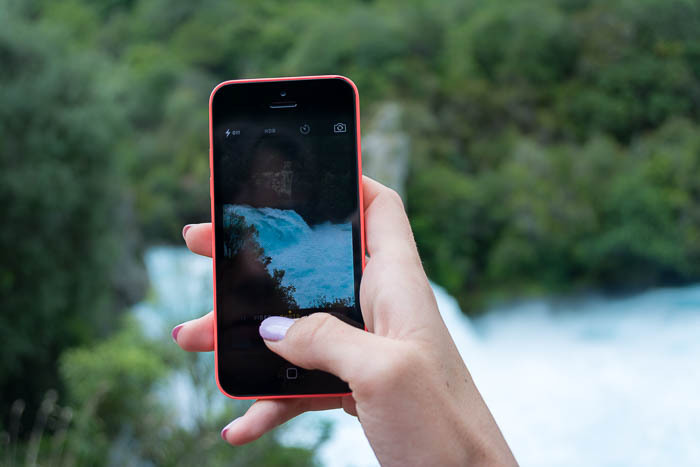 There are also falls, forest, cliffs, sulfurous pools, and caves. But the thing that absolutely left us mouth wide open was the Devil’s Bath. The name says it all. 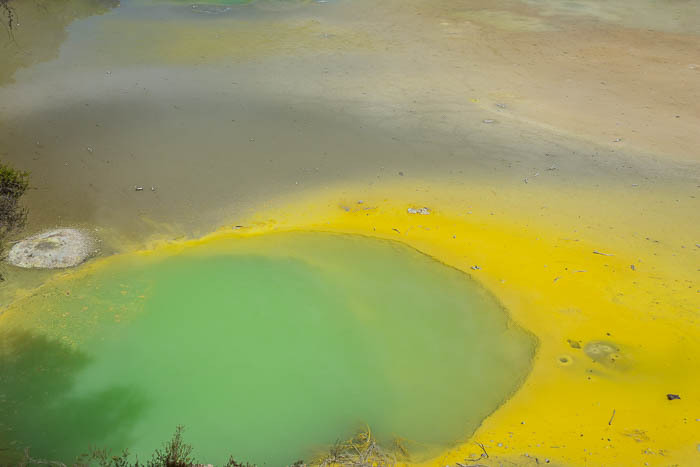 It’s a collapsed crater where excess from the Champagne Pool gathers and mixes with sulphur. It looks like a massive cupcake-frosting experiment gone wrong. We couldn’t stop staring at the color. It’s gross, but also fascinating, and with a name like that, kind of intriguing. 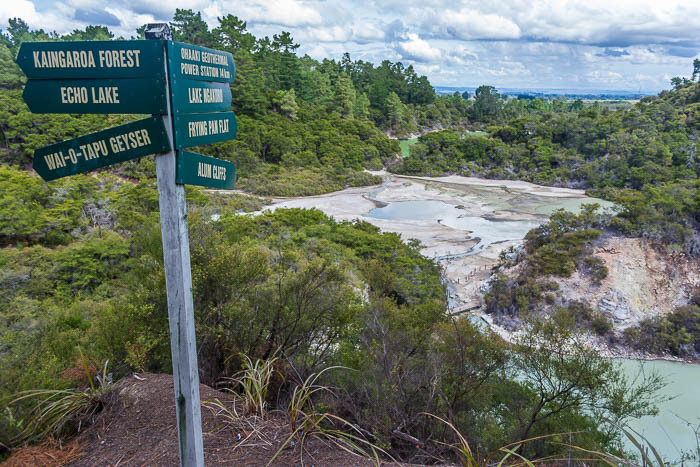 This is the last stop of the third walk of Wai-O-Tapu and then it was time to leave. We spent hours talking about this place and all we’d seen. The slogan is right, it is a thermal wonderland. 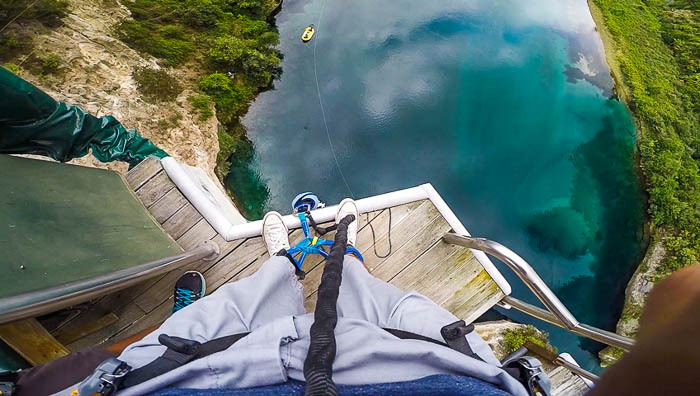 Have you bungy jumped? Where? 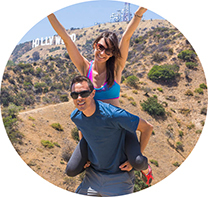 Have you been to thermal spots? Were they as crazy as this one?